Kawa is the Polish for coffee & the word comes from the Turkish kahveh and earlier the Arabic qahwah. The Coffea plant grows as a bush with fragrant white flowers and the fruits are red berries (related to cherries and plums) – the botanical name for these are drupes – fruits contain a single seed known often as a stone – so they are not beans in the botanical sense at all. Coffee was known in Ethiopia in the 11th century and then it was the leaves that were boiled and drunk and they were thought to have medicinal powers. Coffee is recorded in the Yemen in the mid -14th century. By 1555 coffee is known in Istanbul and it is now the beans which are roasted and ground and heated with water – hence Turkish coffee. Coffee came to Europe first through Venice with the first recorded coffee shop being in 1645. In 1683 after the victory by the Polish King Jan Sobieski III(1629 – 1696) against the Turks in Vienna, many sacks of coffee were left behind. One of his Polish officers, Jerzy Franciszek Kulczycki, received these sacks of coffee beans. He opened one of the first coffee houses in Vienna serving small cups of Turkish coffee. Coffee arrived in America not long after this in the late 17th century. Coffee became popular in Poland in the 18th Century. The first coffee café (kawiarnia) was opened in Warsaw in 1724. Coffee in Poland is served as strong black coffee – coffee without milk or cream. It is known as Kawa parzona which means coffee scalded! 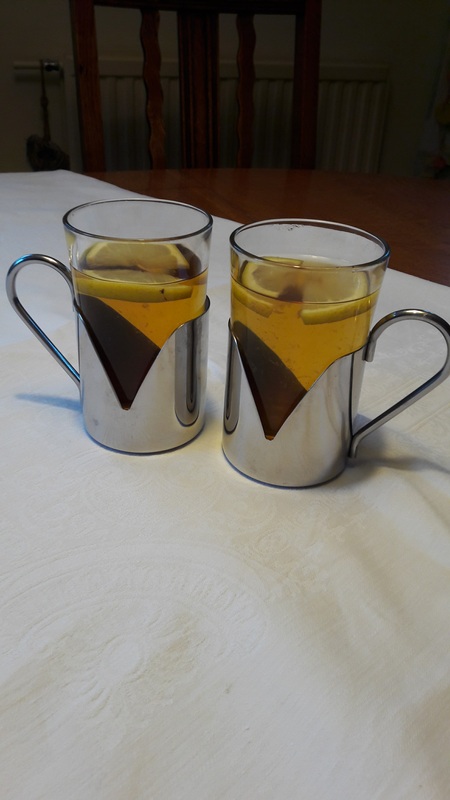 The tradition way is to make coffee in a tall glass with a large tablespoon of ground coffee put in the bottom of the glass and hot boiled water poured onto this and this is left for about 3-4 minutes and then the top is stirred. When you drink the coffee you do not drink down to the bottom, the sediment – the grounds or the lees & in Polish – fusy – are left. I often make myself a coffee this way – it is quick and you only need 1 tablespoonful. 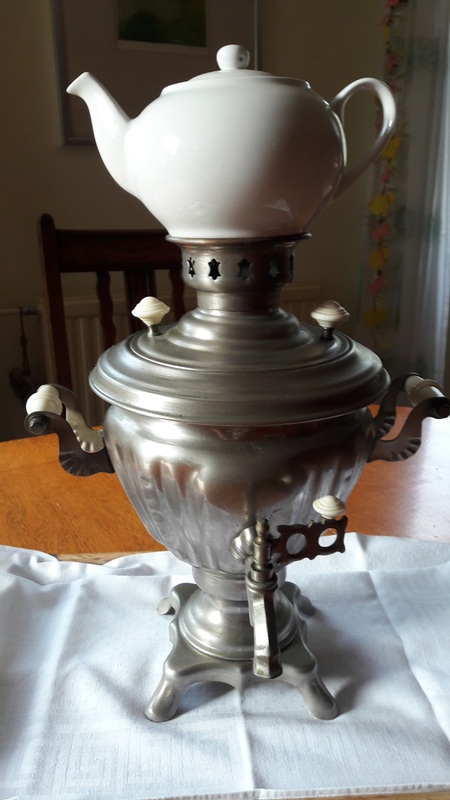 I collect the used coffee ground from this and other methods and use them as top dressing around my strawberry plants & Hostas- many think this is a deterrent to snails. 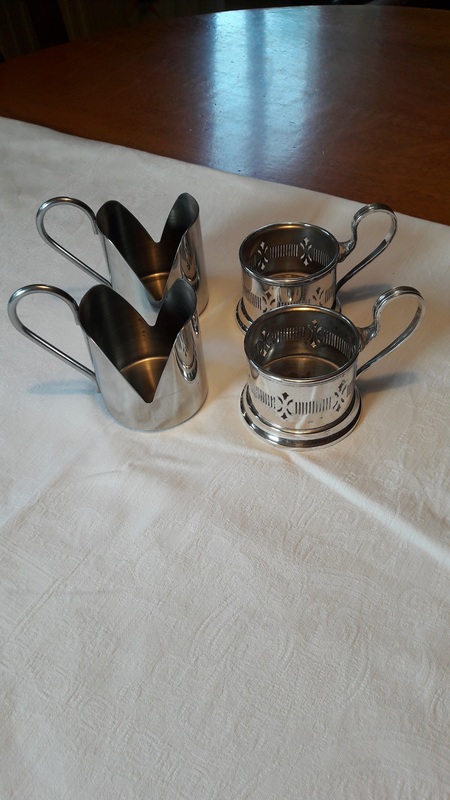 I have an uncle in Białystok who loves coffee and when I was there he showed me various different ways of making coffee; as he used to work in the Middle East we made Turkish coffee several times. There are many methods of making coffee often with electrical equipment. The method I use the most is with a Cafetière or French Press. I think it is the nearest to the old Polish method but the grounds are separated from the coffee in an easy way. 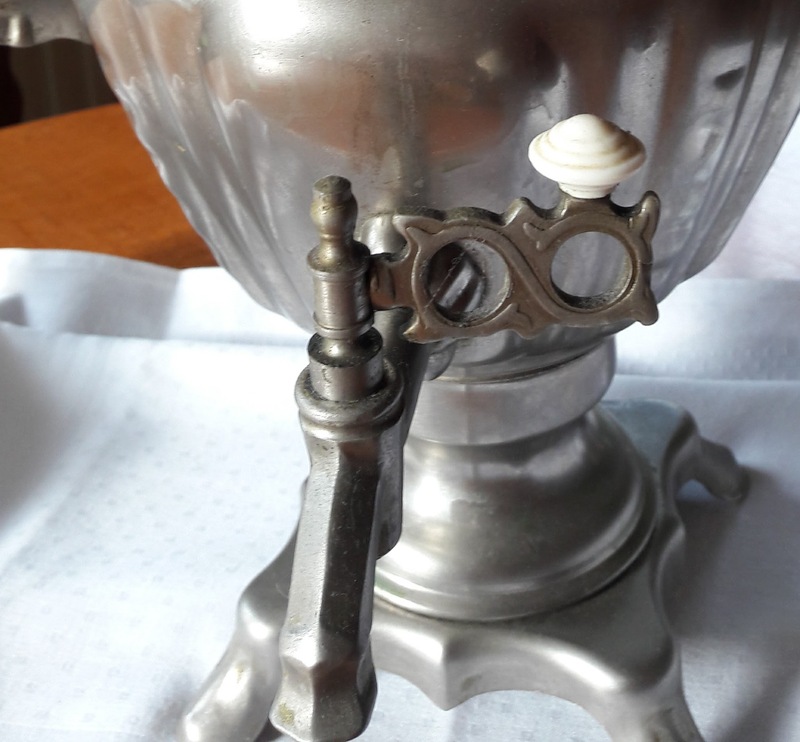 Both the French & the Italians lay claim to inventing the Cafetière. A method of making coffee using a plunger was known in France from the 1850s but a patent was issued in the 1920s to an Italian from Milan. 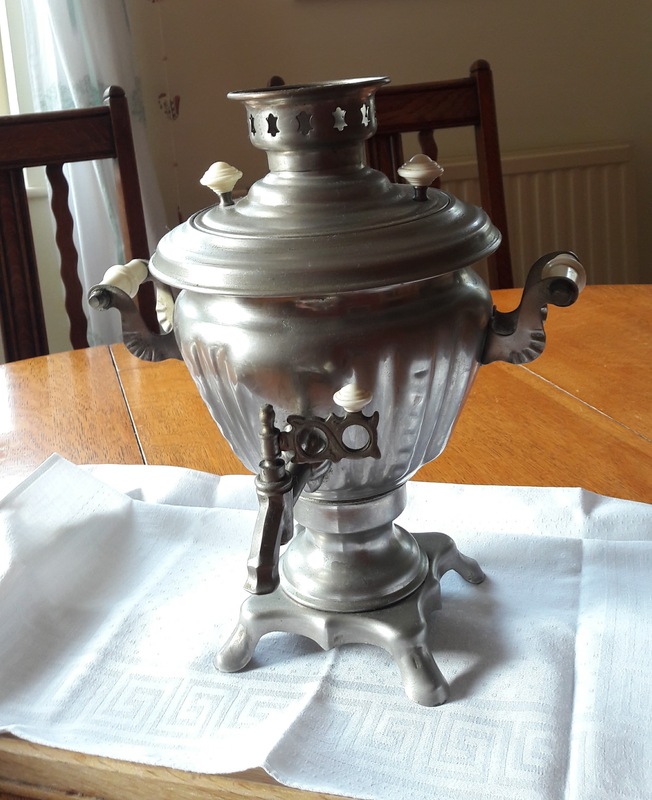 Including: a coffee grinder (a present from my friend in The Netherlands), a Hornsea pottery coffee container, an old and a new cezve or ibrik (Turkish coffee maker) and a pyroflam coffee maker jug from The Netherlands. Placek is a low flat cake and can be round or rectangular in shape. I made two using each of the recipes in ciasto półkruche – a type of shortcrust pastry – with jam fillings and both turned out well. Use half the dough and roll it out to fit the tin. Spread the dough with jam – you will need around a jar. Cover the top with the rest of the dough rolled out. Dust with icing sugar as soon as you take it out of the oven and leave to cool. Courgettes in Polish are cukini – so here is another vegetable that owes its name in Polish to Italian – zucchini. I have read that courgettes did not become popular in Poland until the 1970s although the larger marrow and pumpkins were often cooked and many recipes for these can be adapted for courgettes. Here are 3 ways of cooking courgettes – they all go well with grilled or roast meats such as pork or chicken. This is a very simple Polish way of cooking courgettes. 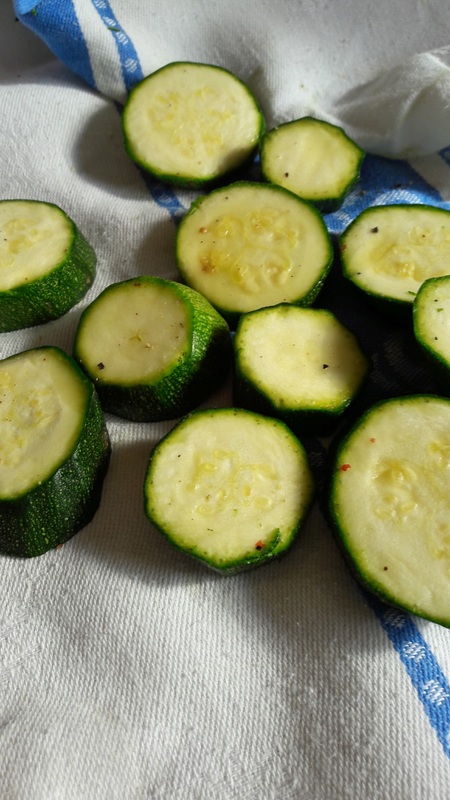 Slice the courgettes and sprinkle them with salt and pepper. Put the plain flour in a dish and toss the slices of courgettes in the flour. Fry them gently on both sides in a mixture of sunflower oil and butter. Place the cooked ones on some kitchen roll in a warm oven whilst you do the next batch. Sliced rounds of courgette are coated with dried breadcrumbs – this recipe reminds me of vegetables served à la Polonaise. Slice the courgettes and place them in a colander and sprinkle them with salt and pepper and leave them for 15 minutes. Dry the courgettes with a clean tea towel or kitchen roll. Toss the courgettes in flour. Dip them into the beaten egg. Coat them with dried breadcrumbs. Fry the slices, on both sides, in hot sunflower oil. If you have any left, they are good with dips such as mayonnaise or salsa. I cannot remember where I got this recipe from but it is a method I have used for years. Put the lemon rind and juice into the pan. Sprinkle salt & pepper on the courgette slices. Add the courgette slices and heat gently for a few minutes and use the lid to keep in the liquid. Add the butter and continue cooking gently. Continue cooking until the slices are tender throughout and the lemon juice and butter have reduced to a buttery lemon coating. Served in a dish by Alfred Meakin – Jayne – from the 1950s. I came across this recipe for a yeast dough mazurek in this little recipe book and was very intrigued by the method which is quite different from the usual yeast doughs and thought I would give it a go! Warm the milk to hand heat and mix in the yeast. Melt the butter on a gently heat. In a bowl whisk the eggs with the sugar until they are light and fluffy. Add the milk and yeast mixture and mix thoroughly. Leave in a warm place for 8 hours! Mix the bakalie(dried fruits) with the flour. Mix the flour and fruits with the yeast mixture. Place the dough into the tin – spreading it out evenly. Place the dough onto the tray and put in the oven. Bake for around 25 – 30 minutes. Prick the surface of the cake with a fork in several places. Leave it to cool in the tin for a while and then remove from the tin and place on a wire rack to cool. Pour the hot chocolate topping over the top. You could double this amount if you want to it to cover all over and be a bit thicker. In a small saucepan gently melt the butter and sugar . Add the cocoa and water and mix it till it is all blended together. Mazurek is the name of a Polish cake which often uses a type of pastry similar to shortcrust or shortcake. It is usually made in a square or rectangular shape. Bake a mazurek base using one of the ciasto kruche – pastry recipes and allow it to cool. Fill the hollow with kajmak. You can decorate the top with nuts and / or dried fruit – this gives you an opportunity to be creative with the decorations. Alleluja is often written on top at Easter time. As a contrast to the sweetness of the kajmak you can use a tart jam such blackcurrant or sour cherry jam. Bake a mazurek base and allow it to cool. Cover the hollow created with a thin layer of jam. Blackcurrant jam was used here. Cover the jam with a layer of kajmak. Decorate the top of the mazurek with nuts or dried fruits. Most people know that a mazurek (mazurka in English) is a Polish folk dance. It is also the word for someone or something from Mazur (the region known as Mazowsze in Polish) in North Central Poland. A tasty meaning of mazurek, is a flat Polish cake made with different bases and toppings. The varieties are seemingly endless and vary from region to region and family to family. They can be made with yeast doughs, crumbly shortbread-like doughs (ciasto kruche) or flaky, puff-pastry-like doughs. The mazurek is usually baked in a rectangular or square shape. The topping varieties include: almond paste, dried fruits, fresh fruits, nuts, meringues, kajmak, jam or poppy seed paste. There is often an icing of some sort poured over the topping. A mazurek is rarely over 2.5 cm (1 inch) in height. 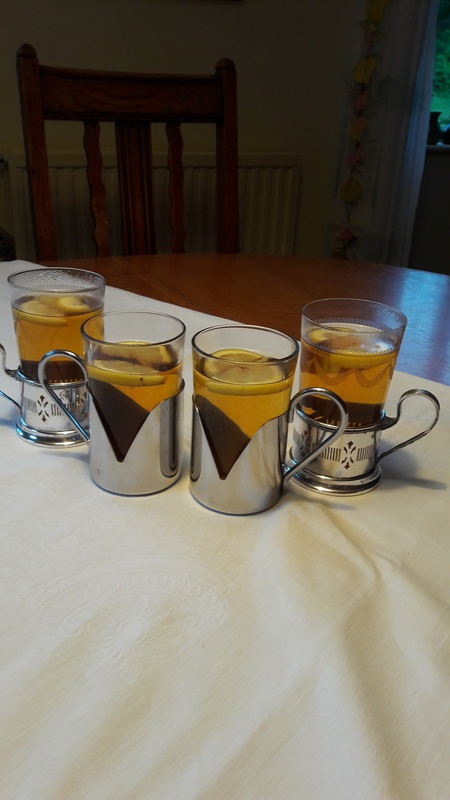 It is thought that the mazurek, was inspired by sweet Turkish desserts that came to Poland via the spice trade routes from Turkey in the early 17th century . Mazurek is traditionally served at Easter when it is considered an Easter treat after 40 days of fasting for Lent and this is maybe why this cake is so sweet. Another reason is that Holy Week, the period from Palm Sunday to Easter Sunday, is a busy one in a Polish household as the interior and exterior of the house is cleaned from top to bottom so any baking that could be prepared well in advance of Easter Sunday without getting stale was good and the mazurek, often made with an over-abundance of dried fruits to keep it moist is well suited to this. When the top of an Easter mazurek is iced , it typically is emblazoned with the words “Alleluja” or “Wesołego Alleluja“ (Happy Alleluja or Happy Easter). I used ciasto kruche for these, using the versions in pastry-ciasto kruche. I liked the one using hard boiled eggs the best. I used a Mermaid shallow tin, 31cm x 21cm, which I greased and lined – to make it easier to get the mazurek out of the tin. 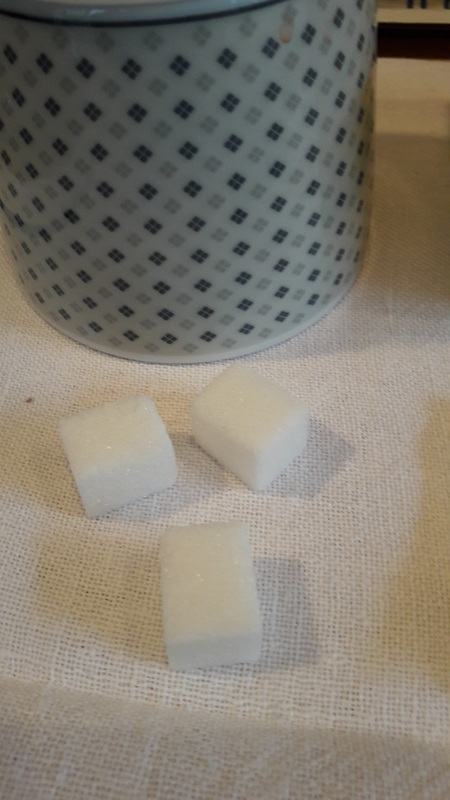 Using around 1/2 to 2/3rds of the pastry dough, roll out a rectangle for the bottom of the tin – if it is too crumbly you might have to piece and press this in. Using the rest of the dough make stripes about a finger thickness and place these around the edge of the tin. Use a sharp knife to make a cut pattern in these strips. Bake for 25 -30 minutes until the pastry is golden. 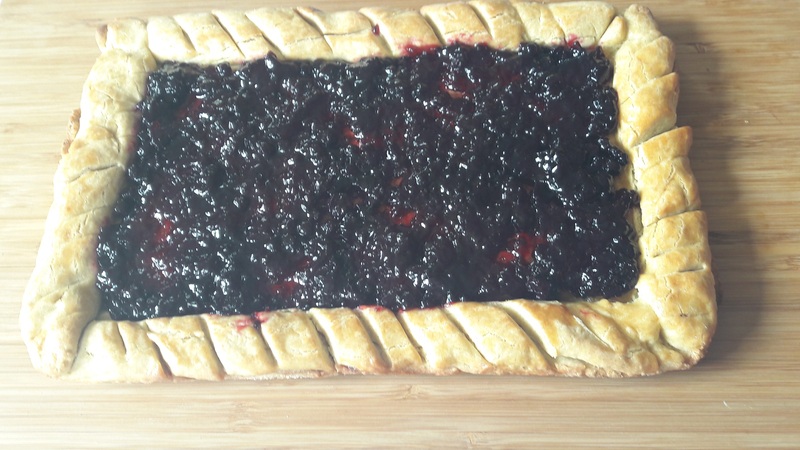 Fill the mazurek hollow with jam. You will need around a whole jar of jar and you can heat the jam slightly to make it easier to spread. Make some icing with beaten egg white, lemon juice and icing sugar and drizzle this over the jam. Served here on a bamboo board and tea plates with a violet design by Colclough from the 1930s. Legend has it that in nearly 3,000 years BC the Chinese Emperor, Shen Nung, was sitting outside when leaves from the evergreen shrub Camellia sinensis fell into some boiling water which he then tasted – and so tea was born! 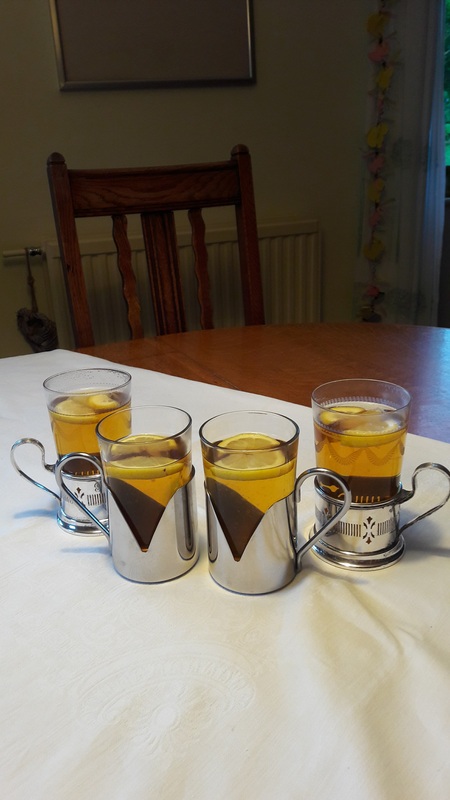 Traders from the Dutch East India Company (Vereenigde Oost-Indische Compagnie)(VOC) first brought tea from China to Holland at the beginning of the 17th century where it became very popular & it was Dutch traders that brought tea to Poland. 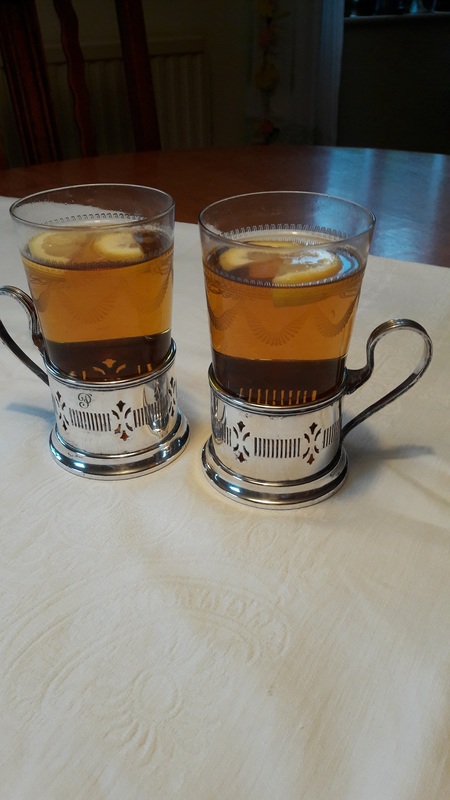 Tea is mentioned in the mid 17th century by King Jan Kazimierz II (1609-1672) in a letter to his wife Ludowika Maria(1611-1667) and the drink became very popular with the nobility. 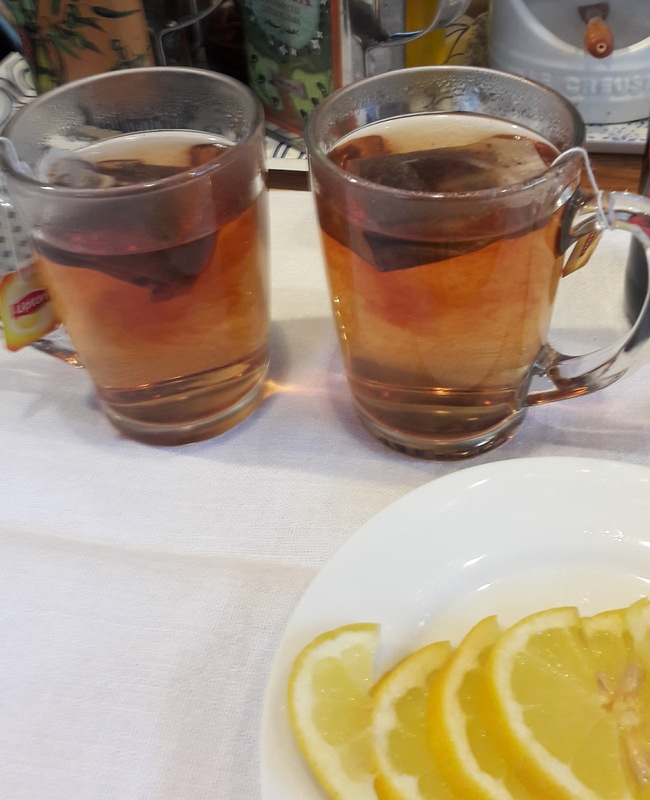 Tea in Polish is herbata which comes from the Dutch Herba thee & which earlier may have been from the Latin Herba thea. 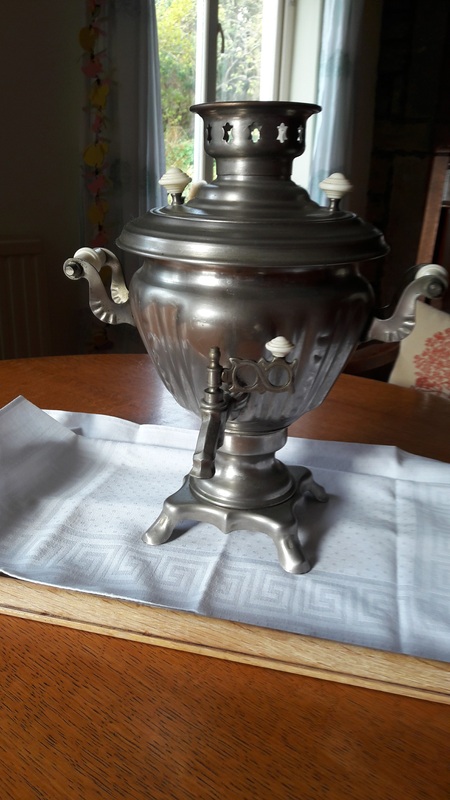 Cza (cha) – is a Chinese word for tea and in Polish the word for a teapot is czajnik. 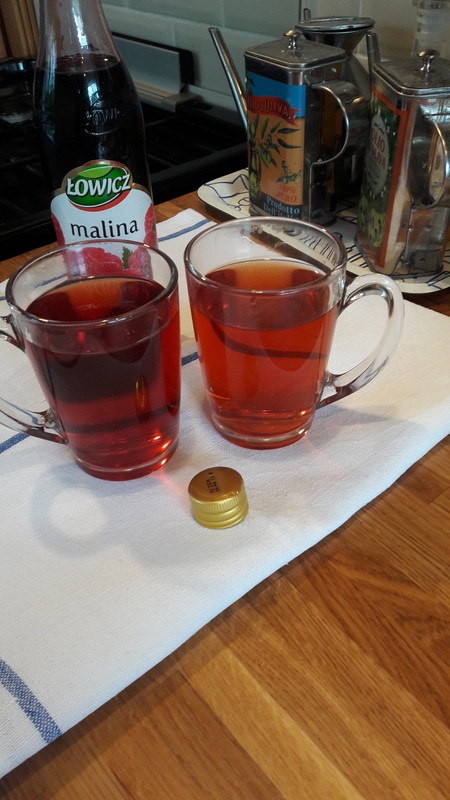 I think tea could be classed as Poland’s national drink and per capita per annum the Polish consumption is the 4th in Europe (figures from 2014) following Ireland, the UK and Russia & in 9th place globally, ahead of Japan and Saudi Arabia. A typical Pole drinks a glass of tea for breakfast, lunch, dinner & supper and in between as well. Tea is served as “black” tea – though in fact it is very light weak tea – it is never served with milk. 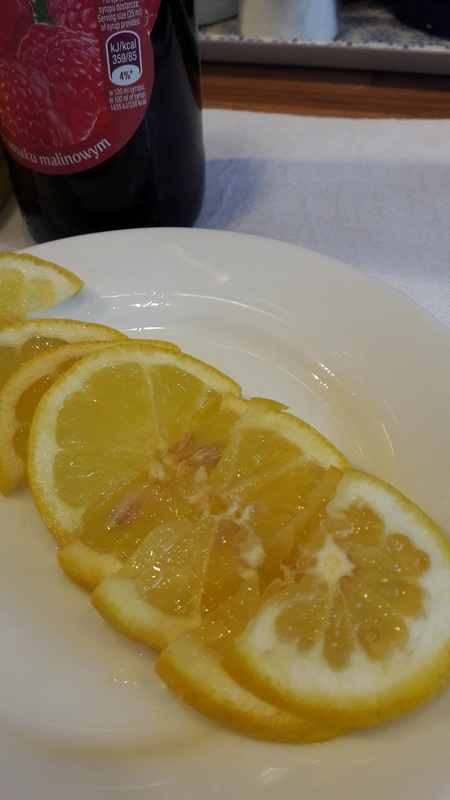 It is served on its own or with slices of lemon or a small amount of fruit syrup such as cherry or raspberry. 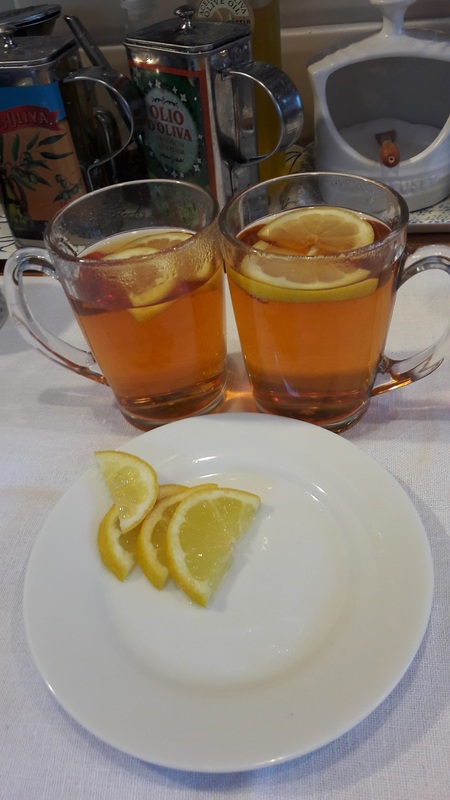 Tea was often served with honey although nowadays it is more likely to be served with sugar. 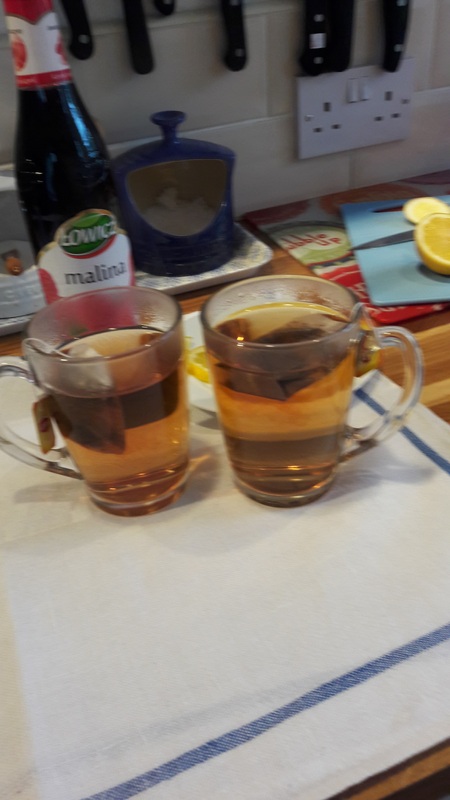 However I usually drink my tea without sweetness, except when I add some fruit syrup. 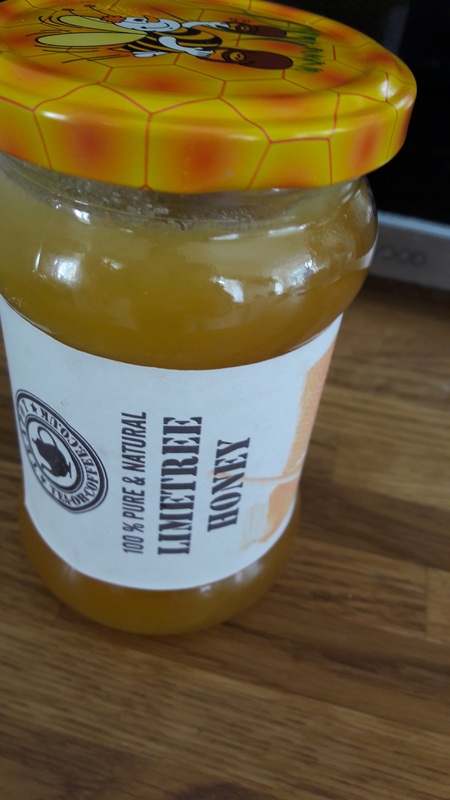 Polish honey from the lime tree also know as the linden tree. The Polish for July is lipiec – meaning the month of the linden blossom – many Polish cities have parks and avenues with linden trees & in July the air is heady with the scent. 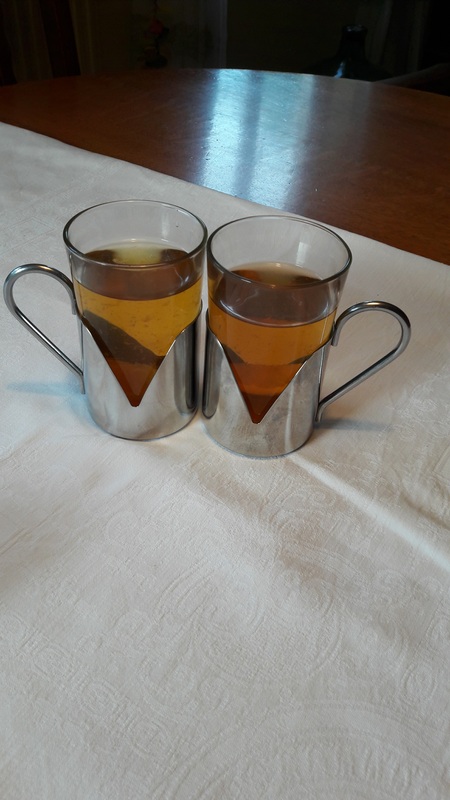 The tradition way is to brew a very strong solution of tea called esencja (essence) and this is poured into a glass or cup and boiling water added to make a very light coloured – weak tea. 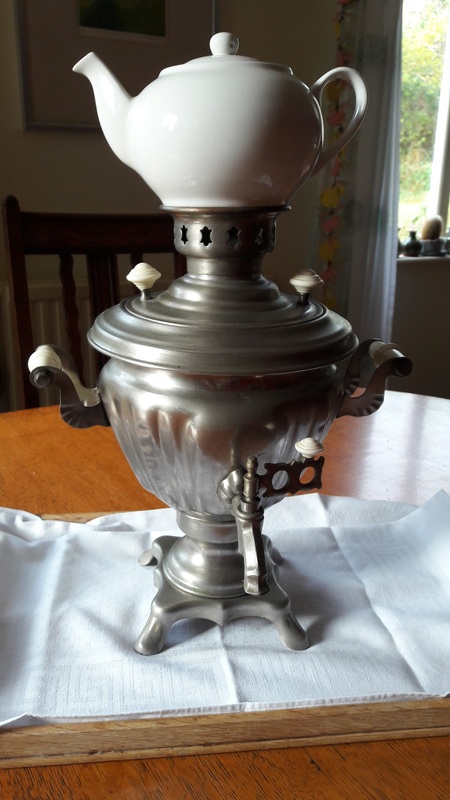 Often a samowar was used with the strong essence of tea kept in the little teapot (often this could be a little enamel pot) and the samowar is used to boil the water and keep the essence warm. Samo means by itself …. war means to heat or to boil. 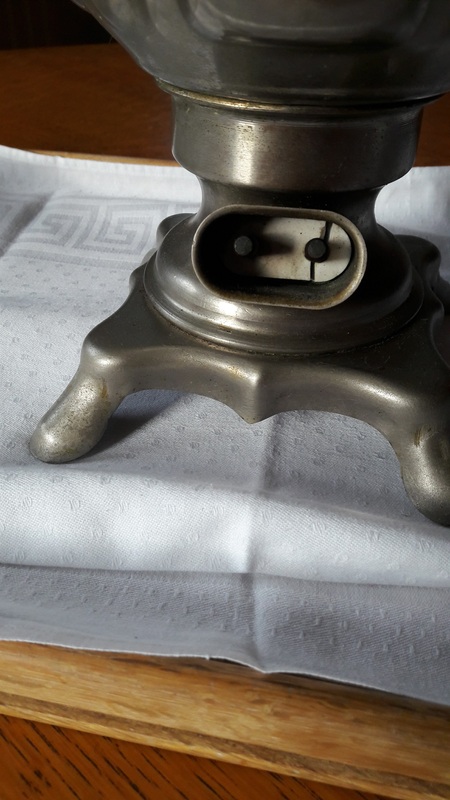 The photographs are of my samowar which is electric – It was made in the 1980s. 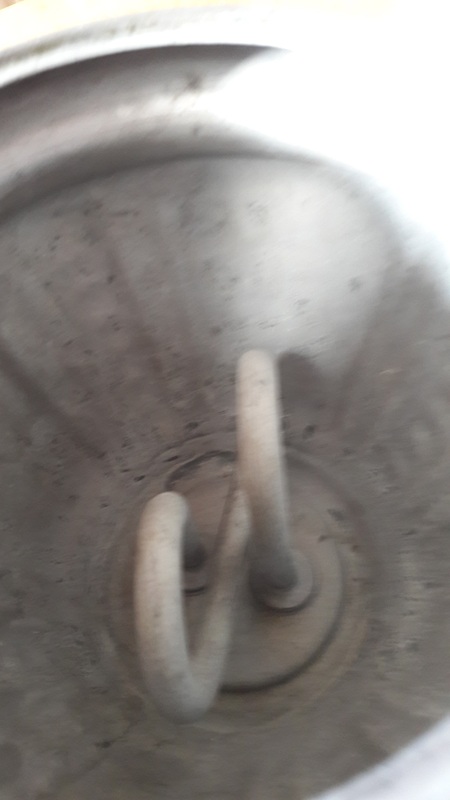 My father talked about their samowar in Poland which had a tube in the centre into which you put hot charcoal to heat the water. 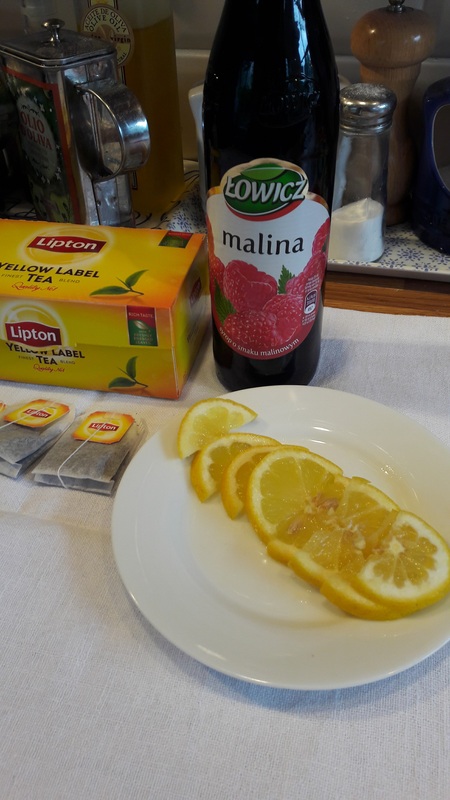 Nowadays tea bags are often used and a very popular brand is Yellow Label from Unilever Polska – Liptons . Thomas Lipton(1848-1931) was from Glasgow, Scotland and Lipton Yellow Label has been sold since 1890 when the first version of the Yellow pack with a red Lipton shield was used. 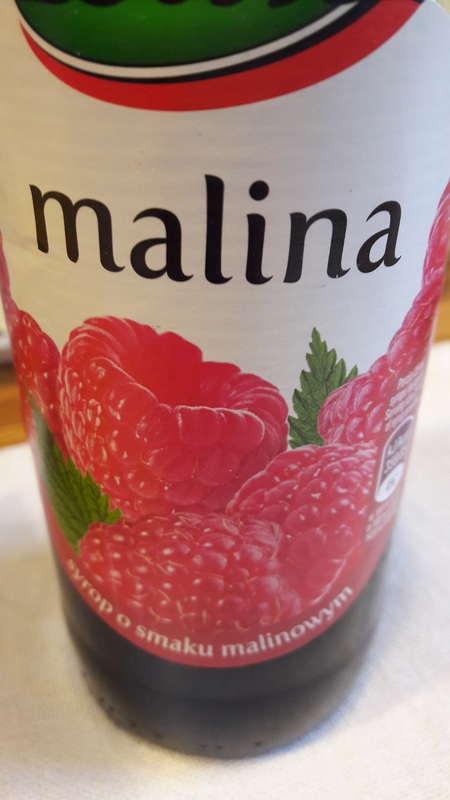 Strangely enough this brand of tea is not marketed in the UK – I used to bring it back from Poland – now I can buy it in all the Polish shops. 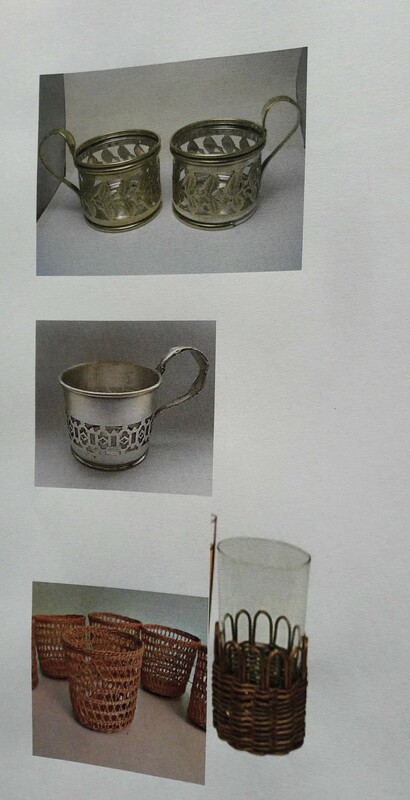 Tea was always served in tall glasses often with a holder of metal or straw . 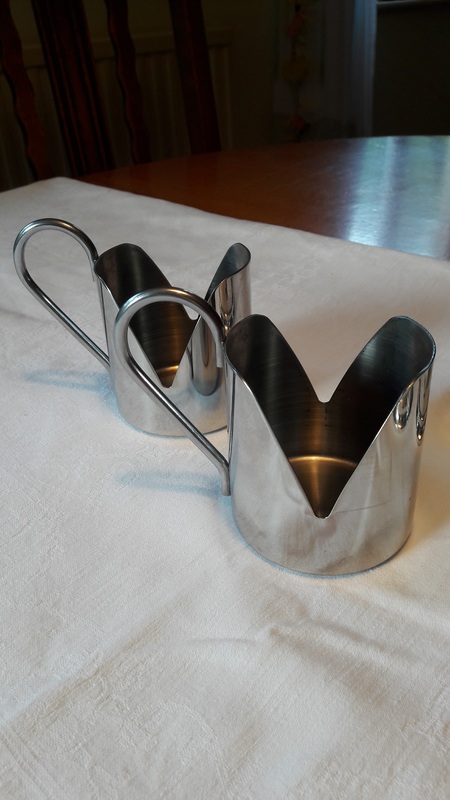 Many years ago I had a big clear out and got rid of my straw holders – I so regret that now! 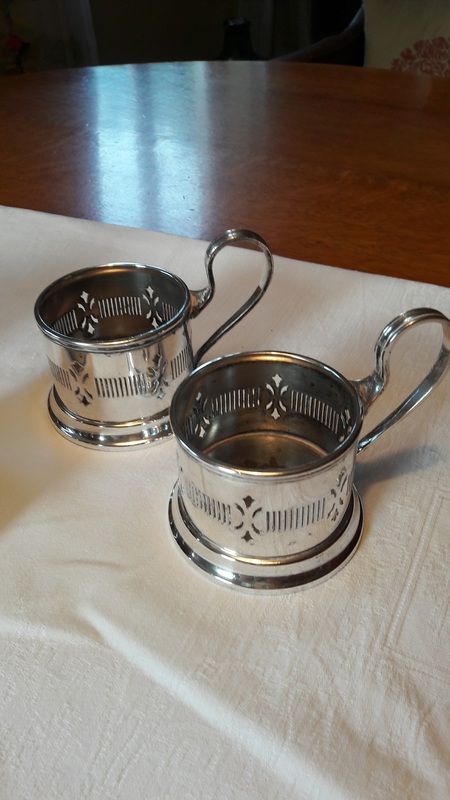 Last Saturday, I went to the second hand market in Huddersfield and found 2 pairs of tea glass holders, 1 pair in stainless steel & 1 pair in silver plate. 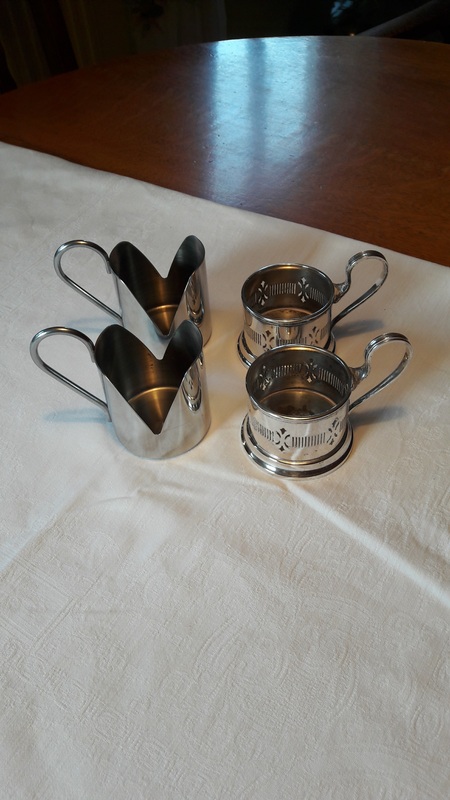 They have cleaned up very well – I am so pleased I found them. Glass handled mugs are a substitute. 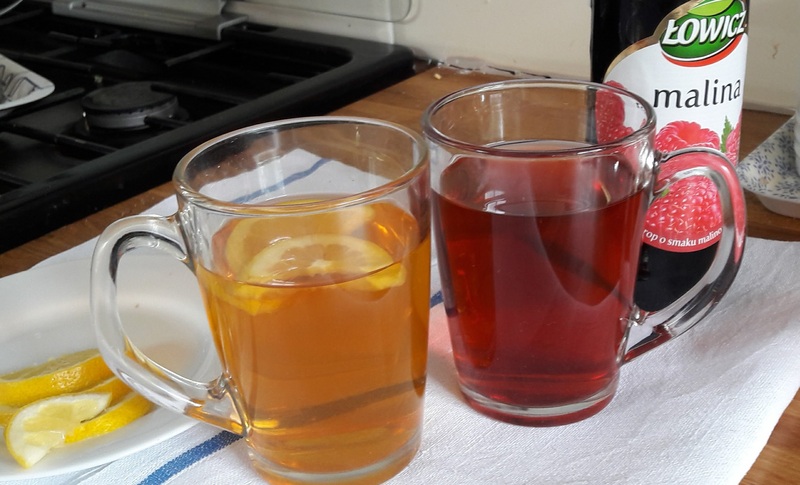 Tea is often used in baking, it can be used to soak dried fruits before making a cake or as part of a poncz (punch) to drizzle over a cake such as a yeast babka.